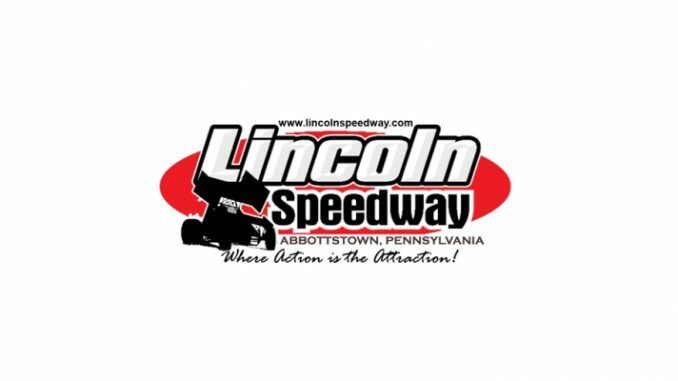 Abbottstown, PA — (September 5, 2015) — It’s impossible to describe the last two laps of Saturday’s “410” sprint car feature at Lincoln Speedway. To simplify the shock that left a packed house in awe, Freddie Rahmer came from fourth to first in a wild last lap to score his first career “410” sprint car win, coming on the heels of brother Brandon’s first career win one week earlier. Billy Dietrich started outside of polesitter Tim Wagaman and led all but the last lap. Freddie Rahmer took second from Wagaman on lap three and chased Dietrich for the next 15 laps. That’s when tenth-starting and 2015 Lawrence Chevrolet track champ Brian Montieth (who claimed the title in warmups) grabbed the runner-up spot from Rahmer with six laps to go. Then enter 11th-starting Danny Dietrich, who was charging through the field and grabbed the third spot from Rahmer with two laps to go. As Montieth, Rahmer, and Danny Dietrich crossed under the white flag, Rahmer was sandwiched between the two in a three-car battle for second in heavy lapped traffic. Montieth slid high in turns one and two and nearly collected Danny Dietrich, with Rahmer sliding under both cars for second heading up the backstretch. He then slid under Billy Dietrich to take the lead in the final turns. All top four cars crossed under the checkered flag within nine-tenths of a second of each other. Billy Dietrich was second, with Montieth third and Danny Dietrich fourth. J.J. Grasso ran in the top five the entire race and finished fifth, with Jimmy Siegel, Austin Hogue, Robbie Kendall, Alan Krimes, and 19-starting Chase Dietz completing the top ten. Heats for the 31 410’s were won by Hogue, Siegel, and Wagaman, with Dietz winning the consolation. Fawn Grove’s Matt Campbell scored his second win of the year in the 20-lap “358” sprint car feature. Campbell drew the pole and led every lap. His win, combined with Doug Hammaker’s third-place finish, closed Campbell to within five points of Hammaker for the 2015 Keiser Aluminum Wheels track title with next week’s race the last points race of the season. Hammaker, who lost a torsion stop on the first lap, claimed the weekend Trail-Way/Lincoln “358” sprint shootout after finishing fourth at Trail-Way Friday night, and held on to the Lincoln points lead by getting around Chandler Leiby for second on lap 11. Kevin Nouse caught Hammaker for the runner-up spot on lap 17. Jeff Halligan came on late to finish fourth, with 12th-starting Adrian Shaffer crossing fifth. Sixth through tenth were Leiby, 16th-starting Jeff Rohrbaugh, Ashley Cappetta, Matt Findley, and 20th-starting Ryan Higgins. Heats for the 24 358 Sprints were won by Findley, Hammaker, and Leiby. The final points tally for the Trail-Way/Lincoln Shootout saw Jeff Rohrbaugh finish second for the two nights, followed by Jeff Halligan, Dwight Leppo, and Mike Bittinger. Scott Dellinger started second, followed polesitter Kenny Edkin the first five laps, took the lead on lap six, and led the rest of the way in the 25-lap super sportsman feature. Third-starting Russ Mitten passed Edkin for second on lap ten and ran there the rest of the way, crossing 1.06 seconds behind the winner. In the final tune-up for the September 19th “Lawrence Chevrolet Sportsman 100,” Edkin settled for third, with Carmen Perigo, Jr. and Frankie Herr rounding out the top five. Heats for the 31 Sportsman were won by Perigo, Bobby Hockenberry, and Chad Smith, with Tom Wyckoff winning the consolation. Next Saturday night, Sept. 12th at 7 PM the Keizer Aluminum Wheels 358 Sprints will race in their final point race of 2015. The 358 late models have been added to the show, and they will be joined by the Central PA Legends and All-American Outlaws. Gates will open at 5 PM with racing action getting underway at 7 PM. 410 SPRINT FEATURE FINISH (25 laps) – 1. 51-Freddie Rahmer; 2. 8-Billy Dietrich; 3. 21-Brian Montieth; 4. 48-Danny Dietrich; 5. 37-JJ Grasso; 6. 59-Jimmy Siegel; 7. 52-Austin Hogue; 8. 55K-Robbie Kendall; 9. 87-Alan Krimes; 10. 44-Chase Dietz; 11. 2W-Glenndon Forsythe; 12. 16-Gerard McIntyre, Jr.; 13. 88-Brandon Rahmer; 14. 69-Shane Hoff; 15. 1*-Tim Wagaman; 16. 35-Steve Owings; 17. 99M-Kyle Moody; 18. 39-Tim Glatfelter; 19. 21K-Kyle Pruitt; 20. 75-Nicole Bower; 21. 8C-Brian Carber (DNF); 22. 49-Bradley Howard (DNF); 23. 5-Tyler Ross (DNF); 24. 45-Kevin Nagy (DNF).